Markets have influenced our acquiring/buying habits from the earliest days of our evolution, perhaps as early as bartering systems in pre-historic times. One tribe had an excess catch from hunting; another tribe had an excess of hides from last season's catch and the market is born. The exchange of goods is motivated by need and its reptilian drive, "survival of the fittest”. Fast forward to today’s modern marketing. As the science of marketing has developed, several concepts have gained wide-spread application. The primary focus today is that fully understanding and tapping into the consumer’s motivation, which can be deeply subconscious, results in brand loyalty in purchasing products and services. An example is Clotaire Rapaille’s approach that to understand the “collective unconscious" and thereby articulate the "code" opens the way to desired marketing success. The foundation of marketing science is based on market research strategy, to know the customer and to fill needs that need filling. Understanding the customer can produce high-quality products, such as Apple has done. On the other hand, some marketing approaches have turned into manipulative endeavors to sculpt the customer to believe they need what’s being sold. This form of marketing is distorted and disturbing. This BLOG post reviews the history and development of marketing as a science, then explores the power of modern customer-centric marketing updated for the digital age, and then looks at the downside of manipulative marketing. Early development of marketing as a science included Louis Cheskin and Neil Borden. 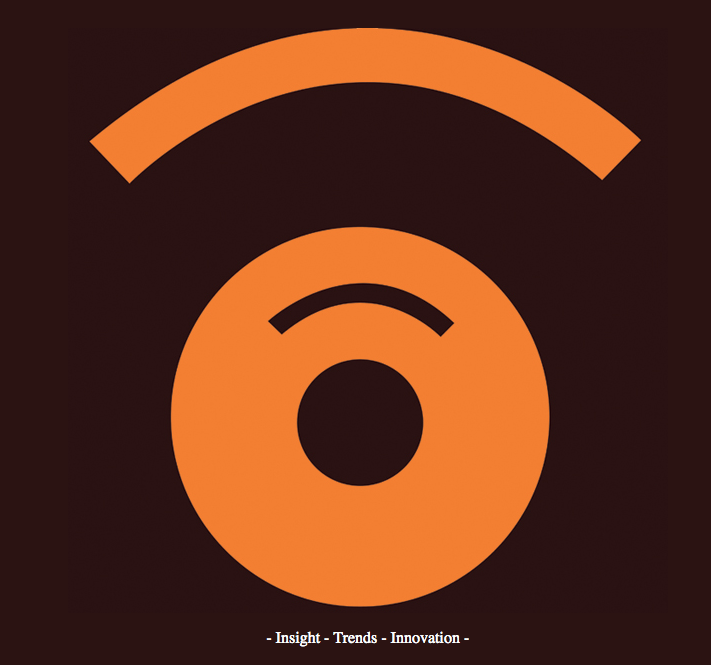 Cheskin contributed the “customer-centric" approach, rather than the top down approach that had been previously popular. The earlier approach to marketing was top-down, where a company would create a new product with the assumption that it would sell. A customer-centric approach is based on consumer feedback, often through customer focus groups and observation. This approach defines the needs of the customer thereby providing products and services that meet those needs. For example, through customer research, Cheskin helped engineer the success of margarine by changing it's color from white to yellow, and advertising it's similarity to butter (Cheskin, 1959). Borden, in his seminal article, “The Concept of the Marketing Mix,” named the 4Ps: Product, Price, Place and Promotion (Borden, 1964). The evolution of technology has brought with it increasing speed as well as additional Ps: People and Performance. We have moved from a top down approach, where the consumer was thought to be one amongst many and easily influenced, to a customer centric approach, where individuality, instinctual desires and inner drives have become the focus of marketers. I believe there is a true purpose to the original intent of marketing. Discovering human needs and providing the products or services that support those needs is the most effective formula for exchange in the marketplace. In Making Meaning: How Successful Businesses Deliver Meaningful Customer Experiences, the authors state, “We envision a time when customers increasingly make their purchase decisions based on deeply valued meanings that companies evoke for them through their products and services - in other words, meaningful consumption - as opposed to simply responding based on features, price, brand identity, and emotional pitches” (Diller, Shedroff, & Rhea, 2008, p. 1). For example, Apple captured the MP3 market with the iPod and iTunes. The iPod became an emotionally constructed appendage that represents much more than just a music device. It has become a cultural icon that people purchase not only for usefulness but also for a sense of belonging, an image of appearing “cool,” and much like a stylistic piece of jewelry, it comes in hip colors and unique styles. Concept Engineering, a market research approach developed by Gary Burchill at MIT, uses an ethnological immersion process called “Voice of the Customer.” Key people on a new product team visit customers, interviewing and observing them in order to discern what the true need is. They are especially trying to discover “latent needs,” needs or wants that the customer has but is not consciously aware of. They then target their new product or service to fill that need or want. This process of listening to the customer allows the new product developers to make meaning of the consumer’s direct experience. Innovation and customer satisfaction can follow (Burchill & Brodie, 1997). Apple is a great example of the power of understanding customer needs and providing products and services to fill those needs. Apple has become a cultural icon for our technological era and this digital age. As I wrote in this week’s forum post, Steve Jobs announced Apple’s newest, latest, greatest and COOLest product this past January with global fan-fare: the iPad. In typical Apple marketing fashion, Apple required customers to wait several months for the iPad’s release. During this time Apple launched a marketing blitz, including an iPad frenzy on Twitter. iTunes has just launched an update for interfacing with the iPad, just in time for the iPad’s release. There was a Netflix app available for the new iPad even before the iPad’s release. Many people tweeted that they were downloading it in preparation for getting their iPad. There were 240,000 pre-orders awaiting the iPad. Apple has found the “code” for “cool,” at least for this digital generation. Apple is a cultural phenomenon, as the MacHead photo illustrates - "the cult of mac.” There are many who are fervently dedicated. The iPod is jewelry in addition to music, an emotional as well as pragmatic piece of “cool,” coming in different colors and styles to match each person’s individual uniqueness. 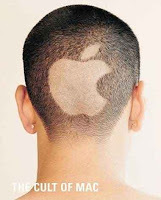 Apple understands its customers and has successfully tapped into their latent needs, capturing the market by storm. 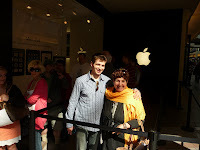 Daniel and I picked up our iPads on Saturday, documenting and interviewing folks in line. On the whole, the Saturday crowd are early adopters who do respond to Apple's advertising. There were 2 mechanical engineers and another student, among many others. The wait was short. The Mac Genius who waited on us was knowledgeable and responsive. 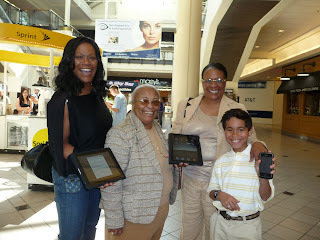 We left with our questions answered, our iPads and leather cases in hand, and BIG SMILES. The picture below shows four generations of Apple users: Stephanie, her Mom, her Grandmom, and her son. This was a family adventure for them. Their smiles and excitement might indicate a bit about their psychology. They said they considered this a bonding experience as they upgraded their technology together and supported one another. They were really enjoying playing with their "new toys." 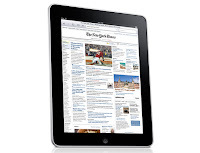 Apple sold 300,000 iPads on Saturday according to reported figures. This first rush of purchases is the "early adopters" phase. 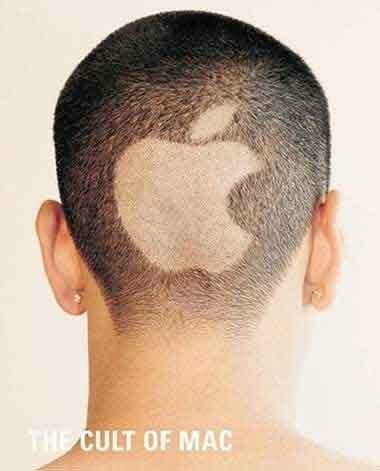 Apple’s next marketing target is to reach more of the general population. There is a downside to current day marketing. The episodes we watched from Frontline highlighted the hidden and manipulative side of marketing in our digital culture. For example, the use of “product placement.” Product placement is a form of embedded marketing. Branded goods are placed, without explicit advertising, in the storyline of movies, TV shows, or other programming. This is often not disclosed at the time the product is being featured. (Wikipedia). Consider that the star of this week’s episode of “Modern Family” is YES: The iPad. 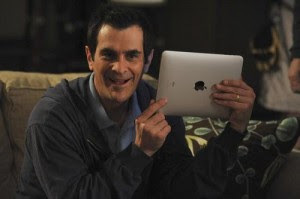 On the eve of the iPad’s launch – Phil Dunphy, one of the main characters in this season’s runaway hit sitcom and touted to be the best new comedy of the year, celebrates his birthday. He is all encompassed in his desire for an iPad. His wife misses the early morning rush to stand in line at the Apple store, eventually getting there only to find they are “sold-out”. Message to audience: get there early, get there or you will miss out. Eventually, Phil’s son manages to get an iPad from one of Phil’s friends through social networking. Phil gets the iPad, everyone is happy, all is right with the world. Whether it was product placement or not, it caused significant stirrings and fans perceived it as such reporting being furious. A typical post on IBDb forums stated, “Tuned in for comedy, sat through a 30 min iPad commercial (Bershad, 2010).” Consumers are becoming increasingly aware and critical of manipulative marketing, either actual or perceived. The message most marketing is driving home to the consumer is MORE IS BETTER. While this is a fallacy, the marketer’s job is to create more and more desire linking satisfaction or fulfillment to their product or service, to continuously consume. In The Paradox of Choice: Why More Is Less, Barry Schwartz explores the world of excess and its impact on our daily lives. In a local supermarket, he found over 30,000 grocery items available, including 285 varieties of cookies. He concluded that having too many choices is bewildering, erodes our psychological well-being, and becomes restrictive rather than freeing (Schwartz, 2005). So, in fact, this culture of consumerism is in a crisis of sorts. Product and service images come rushing towards us from every channel of media available, print, web, movies, tv, mail, email, and others. The message is clear and in many ways enticing. BUY! This onslaught has effected us and our culture. We have become a nation of consumers. Internet marketing continues to develop forums for making the strong voice of consumers heard. Dee Dee Gordon, founder of Look-Look, an online trend tracker, focuses on the younger demographic, those 14 - 30. She is a key contributor to product development. She provides the voice for this younger digital generation by gathering data about their needs, wants, habits, and lifestyles, listening to them and describing their world. Marketing will continue to be a major influence on our decisions. The more we understand our own motivations as well as the marketing techniques used by professionals, the more discerning we will become. Borden, N.H. (1964). The concept of the marketing mix. Journal of Advertising Research. 4(2), 7-12. Burchill, G. & Brodie, C.H. (1997). Voices into choices: Acting on the voice of the customer. Madison, WI : Joiner Publication. Cheskin, L. (1959). Why people buy: Motivation research and its successful application. New York, NY: W. W. Norton & Company. Diller, S., Shedroff, N., & Rhea, D. (2008). Making meaning: How successful businesses deliver meaningful customer experiences. Berkeley, CA: Peachpit, New Riders Press. Schwartz, B. (2007). The paradox of choice: Why more is less. New York, NY: HarperCollins Publishing.